Patients and materials This double-blinded, prospective, randomized, controlled study included 50 patients divided into two equal groups: group A, the control group, which included patients who received the TAP injection with only normal saline and kept on PCA fentanyl; and group B, the TAP block group, which included patients who received the TAP block using 30 ml of bupivacaine 0.25% in addition to PCA fentanyl. The primary outcome was the postoperative 24 h fentanyl consumption, whereas other outcomes included pain scores, heart rate, mean arterial blood pressure, and incidence of nausea, vomiting, excessive sedation, and respiratory depression. 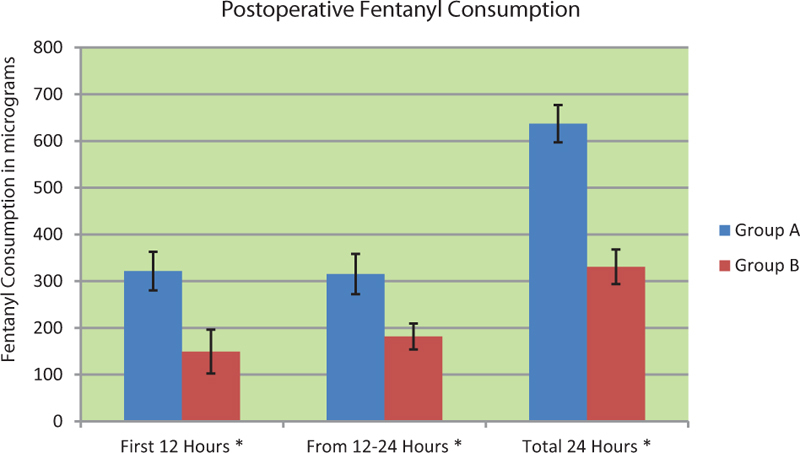 Results Postoperative 24 h PCA fentanyl consumption was significantly lower in the TAP block group (330.9±36.8) compared with the control group (636.9±40) (P<0.01). The pain scores recorded in the TAP group were significantly lower (P<0.01). Mean arterial blood pressure was also significantly lower in the TAP group; however, differences between the recorded heart rates were nonsignificant (P=<0.01 and 0.6, respectively). None of the patients developed excessive sedation or respiratory depression. Conclusion A TAP block with 30 ml bupivacaine 0.25% provides excellent postoperative analgesia for renal transplant recipients and significantly reduced the 24 h postoperative PCA fentanyl requirements and the pain scores. Options for effective postoperative analgesia after renal transplantation are limited by the recipient’s premorbid condition and the pharmacokinetic impact of the recipient’s impaired renal excretory functions. In addition, an initial period of graft dysfunction and the desire to avoid hypotensive episodes that may compromise the return of graft function limit the available choices . Fentanyl is probably safe, although there are reports of the parent compound accumulating in renal failure. Clinical experience is that there are no adverse effects. However, if being used for a long term in renal failure patients, careful monitoring of pharmacodynamic effects is advised . The use of nonsteroidal anti-inflammatory drugs is avoided after renal transplantation because of their potential adverse effects on renal hemodynamics . Furthermore, preoperative coagulopathy often precludes a neuraxial block . The anterior abdominal wall (skin, muscles, parietal peritoneum) is innervated by the anterior rami of the lower six thoracic nerves (T6–T12) and the first lumbar nerve (L1). Terminal branches of these somatic nerves coarse through the lateral abdominal wall within a plane between the internal oblique and transversus abdominus muscles. This intramuscular plane is called the transversus abdominis plane (TAP) . The TAP block provides analgesia for procedures involving the abdominal wall . The block is performed using 20–30 ml local anesthetic (using any local anesthetic concentration as this block relies on local anesthetic spread rather than concentration, that is, it is a volume-dependent block) . TAP blocks have been used in a number of lower abdominal surgical procedures, with investigators reporting reductions in pain scores and opioid requirements . In this study we tried to examine the efficacy of the TAP block using 30 ml bupivacaine 0.25% in reducing the postoperative pain scores and PCA fentanyl requirements in renal transplant recipients. This double-blinded, prospective, randomized, controlled study was conducted at King Faisal Specialist Hospital and Research Center in Jeddah, Saudi Arabia, between 1 June 2015 and 20 January 2016. The study was approved by the Institutional Review board of King Faisal Specialist Hospital and Research Center and a written informed consent was obtained preoperatively from all participants. Assuming that the mean and SD of the PCA fentanyl consumption in the first postoperative 24 h in renal transplant recipients not receiving a TAP block (based on our data and previous experience) are 630 and 67 µg, respectively, sample size estimation revealed that at least 25 patients were needed in each group to detect a difference of at least 10% in this mean with a significance level of 0.05 and a power of 0.9. After sample size determination, patients were randomized into two equal groups (n=25) using the block randomization technique and a research randomizer program. After local institutional review board approval and a written consent from the patients, 50 American Society of Anesthesiologists class II and III patients undergoing living renal transplantation were included in the study. Patients were included if they were between 20 and 60 years old with end-stage renal disease going for living renal transplantation. Patients were excluded if they had any history of allergic reaction to fentanyl or the local anesthetic bupivacaine, with coagulation disorders, inability to use PCA, and if the patient was known to be a drug abuser. Patients were randomly assigned into two groups: group A, the control group, which included patients who received an ultrasound-guided TAP injection by 30 ml normal saline 0.9% and were kept on PCA fentanyl postoperatively; and group B, the TAP block group, which included patients who received an ultrasound-guided TAP block by 30 ml bupivacaine 0.25% at the end of the procedure and were also kept on PCA fentanyl postoperatively. The primary outcome was total fentanyl consumption in the first 24 h after renal transplantation and other outcomes included the pain scores, the mean arterial blood pressure (MAP) and heart rate, and incidence of nausea or vomiting, excessive sedation, and respiratory depression in the first postoperative 24 h.
All our patients had their dialysis session the night before the operation, and preoperatively the patient were connected to the basic monitors as ECG, noninvasive blood pressure, and pulse oximetry. All patients received a standardized anesthesia technique including the administration of fentanyl 1–2 µg/kg, propofol 2–3 mg/kg, and nondepolarizing muscle relaxant atracurium 0.5 mg/kg. After endotracheal intubation, patients were mechanically ventilated and an arterial cannula was inserted in all patients for invasive blood pressure monitoring in addition to a central venous catheter. Patients were maintained on sevofurane in a mixture of air and oxygen in addition to incremental doses of fentanyl as needed and 4 mg granisterone; in addition, 1 g paracetamol (perfalgan) intravenously was given with the wound closure. According to the randomization table, patients then received either a TAP injection with 30 ml 0.9% saline in the control group A or a TAP block with 30 ml of bupivacaine 0.25% in the TAP block group B. A TAP saline injection and block were given to all patients after wound closure and before starting recovery. Syringes containing either saline 0.9% solution or bupivacaine for the TAP block were prepared by an anesthesiologist other than the investigator performing the block and collecting the postoperative data, and thus, the investigator, the surgical staff, the recovery and renal transplant unit nurses, and the patients were all blinded to the group randomization. All surgeries were performed by the same surgical team and the same incision was used, which was the right pelvic Gibson incision (oblique or curvilinear incision parallel to the inguinal ligament). The TAP block given was ultrasound-guided using the technique described by Hebbard et al. , where each patient was in the supine position and the abdomen was exposed between the costal margin and the iliac crest, and then following skin and transducer preparation, a high-frequency ultrasound probe of 5–10 mHz was applied transversely to the anterolateral abdominal wall where the three muscle layers are most distinct. After identification of the TAP between the internal oblique and transversus abdominis muscles, the probe was moved posterolaterally to lie across the midaxillary line superior to the iliac crest. After that, a 22 Ga×3.15 in. (8 cm) Tuohy epidural needle (B Braun, Bethlehem, Japan) was introduced anteriorly and advanced in an in-plane approach. Real-time ultrasonography facilitates easy needle visualization as it approaches and reaches the target fascial plane between the internal oblique and the transversus abdominus muscles. A hypoechoic layer, created by injection of local anesthetic or the 0.9% saline, was also easily visualized. Following injection, our patients were recovered, extubated, and transferred to the renal transplant unit. Vital data on admission were recorded and patients were started on PCA fentanyl with a concentration 10 µg/ml, PCA dose 1 ml, lockout interval 6 min, and without continuous infusion dose. Patients in the two groups were also kept on 1 g paracetamol intravenously given every 6 h postoperatively. Participants’ age and weight were recorded; their MAP and heart rate were continuously monitored and were recorded every 30 min for the first 6 h postoperatively and then every hour from the 6 to 24 h postoperatively. Pain scores, calculated according to the numeric pain rating scale from 0 to 10 (0=no pain, 10=worst possible pain), were assessed and recorded every 2 h in the first 12 h postoperatively and every 4 h from 12 to 24 h postoperatively; moreover, the total 12 and 24 h postoperative fentanyl consumption was recorded. The following were also recorded at similar time intervals: nausea, vomiting, sedation, and respiratory depression. Nausea and vomiting were either present or absent. Sedation was scored as per the Ramsay scale (1=anxious or agitated; 2=cooperative, tranquil and oriented; 3=responds only to verbal commands; 4=asleep with brisk response to light stimulation; 5=asleep without response to light stimulation; and 6=nonresponsive). Respiratory depression was recorded as present or absent, and was defined as a respiratory rate less than 8/min. The primary outcome was the total fentanyl consumption in the first 24 h postoperatively, whereas the secondary outcomes included the pain scores, the MAP and heart rate, and incidence of nausea, vomiting, excessive sedation, and respiratory depression in the first 24 h postoperatively. Results of fentanyl consumption, pain scores, MAP, and heart rate were expressed as mean and SD. The difference between the two groups at every point of measurement was compared using the paired sample t-test, and the total trend difference for each outcome between the two groups in the first 24 h postoperatively were also measured by using the paired sample t-test. P-values less than 0.05 were considered statistically significant. Between 1 June 2015 and 20 January 2016, 50 patients were included in the study, who were divided into two groups: group A, the control group, which included 25 patients who received a TAP injection with 0.9% saline, and group B, which included 25 patients who received a TAP block with 30 ml bupivacaine 0.25%. The demographic data as well as the operation time showed no significant differences between the two groups. Moreover, the difference regarding intraoperative fentanyl consumption in both groups was nonsignificant, and there was no difference in the incidence of nausea and vomiting in both groups, as shown in [Table 1]; and none of our patients developed respiratory depression or excessive sedation. As shown in [Table 2], first, we assessed the fentanyl consumption in the first 12 h postoperatively, and it was evident that group B patients significantly consumed lesser amount of fentanyl (149.3±46.9 µg) compared with group A patients (321.7±41.3 µg) (P=0.01). 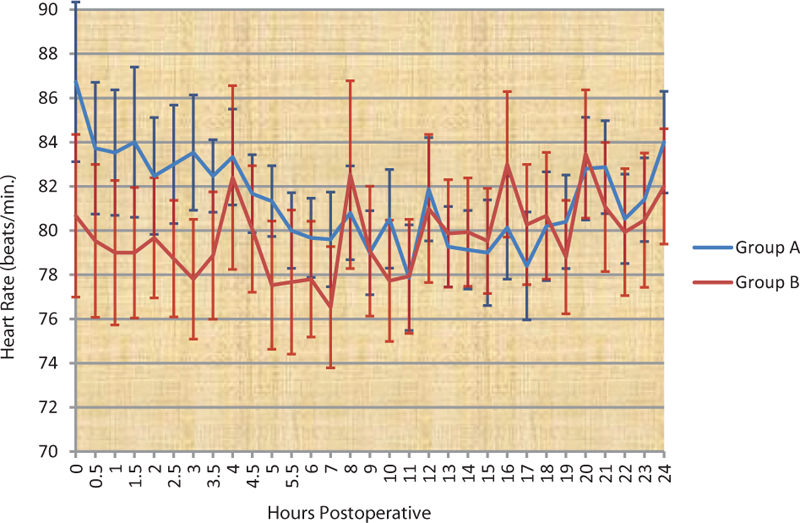 From 12 to 24 h postoperatively, although the group B consumption increased a little bit to reach 181.6±27.7 µg, it was still significantly lower than that of group A (315.2±43.2 µg) (P=0.02). Furthermore, the difference between the total 24 h fentanyl consumption in both groups was significant (P=<0.01). [Figure 1] illustrates the postoperative fentanyl consumption in both groups with significantly lesser consumption in group B (the TAP block group) compared with group A (the control group) (P=0.01 in the first 12 h and 0.02 from 12 to 24 h postoperative). In addition, the total 24 h consumption in group B was significantly lower than that in group A (P<0.01). Pain scores were significantly less in the TAP block group patients as compared with those of the control group, starting from the time patients were admitted to the renal transplant unit to about 16 h postoperatively, and yet after that and till 24 h postoperatively, pain scores were statistically nonsignificant between the two groups. The overall assessment of pain scores in 24 h postoperatively showed significantly higher pain scores in the control group (4.64±0.22) compared with the TAP block group (3.13±0.24) (P<0.01). [Figure 2] illustrates the difference in pain scores between the two groups; it was significantly higher in the control group compared with the TAP block group in the first 16 h, and yet after that and till 24 h postoperatively the difference became nonsignificant. However, for the whole 24 h, pain scores for group A were significantly higher than that of group B (P<0.01). In our study, the MAP was assessed on admission to the renal transplant unit, every 30 min in the first 6 h postoperatively, and then every hour from 6 to 24 h postoperatively. The MAP readings were significantly higher in the control group patients when compared with the TAP block group patients, except at 8, 12, 14, and 16 h postoperatively, where they were nonsignificant. When we compared the overall trend of the MAP in the 24 h between the two groups, it was significantly higher in group A (83.35±35) than in group B (73.23±2.07) (P=0.02). [Figure 3] illustrates the difference between blood pressure in both groups in the first 24 h postoperatively, which was significantly higher in group A (P<0.01). The heart rate in all patients was recorded on admission to the renal transplant unit, every 30 min in the first 6 h postoperatively, and then every hour from 6 to 24 h postoperatively. We could not find any significant differences between the two groups as regards heart rate at any point. Furthermore, when the difference between the mean 24 h heart rate in group A (79.69±1.48) and group B (78.11±2.53) was nonsignificant (P=0.6). [Figure 4] shows a nonsignificant difference between the two groups as regards the heart rate at all points of testing (P=0.6). The TAP block is one of the nerve block methods used to control postoperative pain in renal transplant recipients. Most of the studies conducted previously used to examine its ability to reduce the postoperative morphine requirements in these patients. In our study, we tried to examine the efficacy of the TAP block in reducing postoperative PCA fentanyl requirements in these patients. Moreover, the effect of the TAP block on pain scores, mean blood pressure, and heart rate was examined. We injected a good volume (30 ml) of bupivacaine 0.25% to ensure good anesthetic volume in the TAP as most of the previous studies used only 20 ml. The TAP block significantly reduced the PCA fentanyl requirements, especially in the first 12 h postoperatively, as patients who received the TAP block with 30 ml bupivacaine 0.25% consumed about 53.6% less fentanyl than did the patients in the control group, and from 12 to 24 h they consumed about 42.4% less fentanyl than did the control group; overall, in the first 24 h the TAP block significantly reduced the postoperative fentanyl requirements by about 48%. 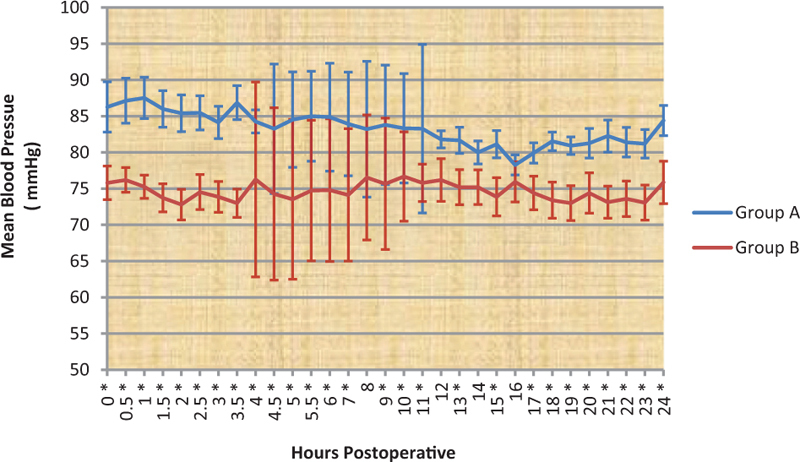 The TAP block also significantly reduced the postoperative pain scores as compared with the control group in the first 16 h postoperatively; however, from 16 to 24 h postoperatively, the pain scores were nearly the same in both groups. But the overall scores in 24 h were still significantly higher in the control group. In addition, the MAP in the first postoperative 24 h in patients who received the TAP block was significantly lower than the control group, and yet the heart rate was nonsignificant between the two groups, which may be attributed to the fact that all patients were hypertensive and were either on β-blockers or calcium channel blockers, which may prevent the tachycardia response to pain. Kadam and Field examined the efficacy of continuous TAP block infusion using 0.2% ropivacaine for 72 h in reducing the pain scores and the postoperative fentanyl requirements in 20 patients who had undergone abdominal surgeries. 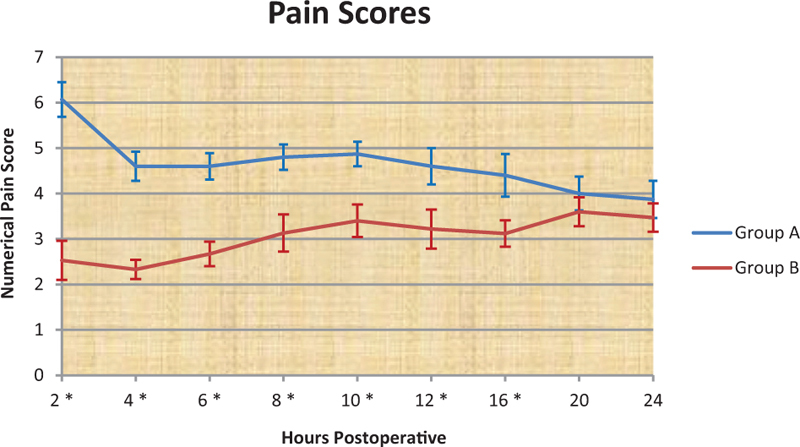 They found that the pain scores were significantly lower in the TAP group than in the control group in the first 2 days but not on the third day; moreover, the PCA fentanyl requirements were significantly lower only in the TAP group on the first postoperative day . In a study by Sussan and colleagues on 44 patients divided into two groups, the efficacy of the TAP block performed intaroperatively using 15 ml of 0.25% bupivacaine+5 μg/ml epinephrine in reducing the intraoperative fentanyl and the postoperative morphine requirements was assessed. They found that narcotic requirements were significantly reduced in the TAP block group than in the control group, both intraoperatively and postoperatively . Inspite of using a low volume of local anesthetic, it seems that the addition of epinephrine helped in intensifying the block and delaying systemic absorption. In their study, Gulyam Kuruba and colleagues did not find any statistically significant difference in the intraoperative fentanyl and morphine consumption or the postoperative morphine consumption in 54 renal transplant recipients. Their patients were divided into two groups, a control group and another group in which patients received the TAP block using 20 ml bupivacaine 0.5% after induction of general anesthesia and before surgical incision. They attributed their findings to the possible loss of the local anesthetic in the surgical field; as the surgery involves dissection into the TAP also, the short interval between performing the block and surgical incision may have prevented sufficient time for full absorption and distribution of the local anesthetic, and hence leading to a shorter duration of action, and a less pronounced effect . In their study they used only 20 ml of local anesthetic, whereas we used 30 ml, which may also explain the nonsignificant effect of the block in their study. Noelle and colleagues also the examined the effect of the TAP block performed blindly and not by using ultrasound in reducing the postoperative morphine requirements in cadaveric renal transplant recipients. Their study included 65 patients divided into two groups, a control group and a TAP block group where patients received 20 ml of bupivacaine 0.375%. They found that the TAP block performed after the induction of general anesthesia did not reduce the postoperative 24 h morphine consumption. A possible cause of that may be that the block was performed blindly in that study, whereas in our study it was guided by ultrasound, which was shown to have more success rate; in addition, the low volume of local anesthetic (20 ml) may be not sufficient . From the previous findings it was clear that the TAP block with 30 ml bupivacaine 0.25% is effective in postoperative pain control, especially in the first 12–16 h postoperatively, after which its efficacy starts to decline. We recommend the use of the TAP block, especially with high volume (30 ml) of local anesthetic, as part of a balanced analgesia regimen for renal transplant recipients. The significant pain relief provided in the first 24 h after operation coupled with the ease of performing the ultrasound-guided block and the good safety profile makes it an appealing choice for this group of patients. Lee PC, Hung CJ, Lei HY, Tsai YC. Suspected acute post transplant neuropsychosis due to interaction of morphine and cyclosporine after a renal transplant. Anaesthesia 2000; 55:827–828. Dean M. Opioids in renal failure and dialysis patients. J Pain Symptom Manage 2004; 28:497–504. Stahl RAK. Non-steroidal anti-inflammatory agents in patients with a renal transplant. Nephrol Dial Transplant 1998; 13:1119–1121. Bhosale G, Shah V. Combined spinal − epidural anesthesia for renal transplantation. Transplant Proc 2008; 40:1122–1124. Mc Donnell JG, O’Donnell BD, Farrell T, Gough N, Tuite D, Power C, Laffey JG Transversus abdominis plane block: a cadaveric and radiological evaluation. Reg Anesth Pain Med 2007; 32:399. Mc Donnell JG, Curley G, Carney J, Benton A, Costello J, Maharaj CH et al. The analgesic efficacy of transversus abdominis plane block after cesarean delivery: a randomized controlled trial. Anesth Analg 2008; 106:186–191. Mukhtar K. Transversus abdominis plane (TAP) block. J N Y School Reg Anesth 2009; 12:28–33. Kadam RV, Field JB. Ultrasound-guided continuous transverse abdominis plane block for abdominal surgery. J Anaesthesiol Clin Pharmacol 2011; 27:333–336. Mohammadi SS, Dabir A, Shoeibi G. Efficacy of transversus abdominis plane block for acute postoperative pain relief in kidney recipients: a double-blinded clinical trial. Pain Med 2014; 15:460–464. Gulyam Kuruba SM, Mukhtar K, Singh SK. A randomised controlled trial of ultrasound-guided transversus abdominis plane block for renal transplantation. Anaesthesia 2014; 69:1222–1226. Freir NM, Murphy C, Mugawar M, Linnane A, Cunningham AJ. Transversus abdominis plane block for analgesia in renal transplantation: a randomized controlled trial. Anesth Analg 2012; 115:953–957.